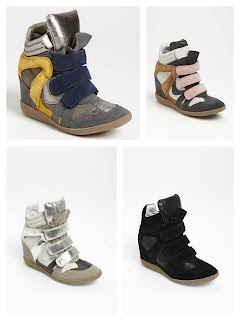 ...that is the question I am plagued by when it comes to the Isabel Marant sneakers. I am currently obsessing over these shoes. They give off that "super cool without trying too hard" vibe. Thanks to Marant's brilliant design, these innovative kicks also give your height a boost because there is a wedge hidden inside. Now to just choose a color! What do you think of the wedge-sneaker? Would you ever wear it? Do you think it's a fad that's going to fade quickly?